in period attire and the lack of starting lights. Fantastic! With this year’s Festival of Speed now a fond but distant memory for the 181,000 enthusiastic spectators that attended the event, the excitement for motor racing at Goodwood is growing again with just over nine weeks to go until the 2011 Goodwood Revival (16-18 September) gets underway with its mouth-watering grids, scintillating on-track action, and a number of significant anniversaries to celebrate. 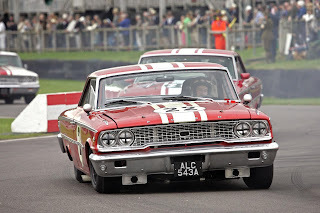 The 2011 Revival is set to build on the success of last year’s event, when a record-breaking 134,000 people attended over the weekend. As ever, the Revival offers visitors of all ages a chance to revel in the romance and glamour of motor racing as it used to be. 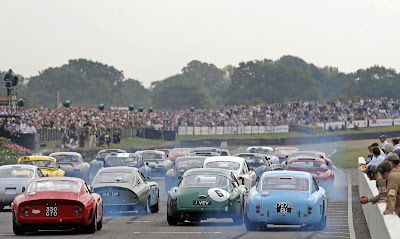 It is the only sporting event in the world set entirely to a period theme and, every year, spectators and competitors take a magical step back in time by getting into the effervescent Goodwood spirit. The majority of visitors enter into the spirit of the event, dressing in appropriate clothing from the 1940s, ’50s and ’60s. The one-hour, two-driver Royal Automobile Club TT Celebration race remains the jewel in the Revival’s crown. Nowhere else in the world will you see such a spectacular grid of super-rare GT cars racing in anger, driven by great aces past and present. The grid will once again feature a breathtaking £100+ million array of internationally-renowned historic cars. Expect to see Ferrari 250 GTO, GT SWB and 330 LMB; Aston Martin DB4GT, Zagato and Project cars; plus AC Cobra and the rare Shelby Daytona. This year’s Fordwater Trophy will be very special indeed, featuring a grid exclusively made up of Jaguar E-types, in celebration of the model’s 50th anniversary. It will be a 45-minute two-driver race, with driver changes in the pits between 15 and 30 minutes. With a mixture of lightweights, roadsters, fixed head coupés and low drag coupés, it should make for an intriguing spectacle and a fitting tribute to Britain’s most popular sports car and its special relationship with Goodwood. 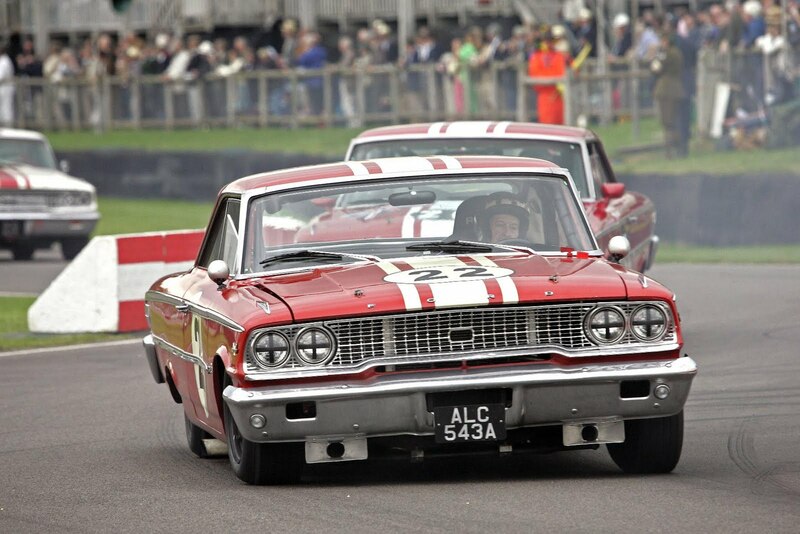 This year’s St Mary’s Trophy will feature cars from the 1960s – a truly golden age of touring car racing. Expect to see a thrilling and close-fought battle between such diverse and classic cars as Jaguar MkII, Ford Galaxie, Mini Cooper S, Lotus Cortina, Saab 93, Alfa Romeo GTA and BMW 1800 TiSA. As ever, the format will be a celebrity race on Saturday, with the car owners taking their turn on Sunday, and the result declared on aggregate. 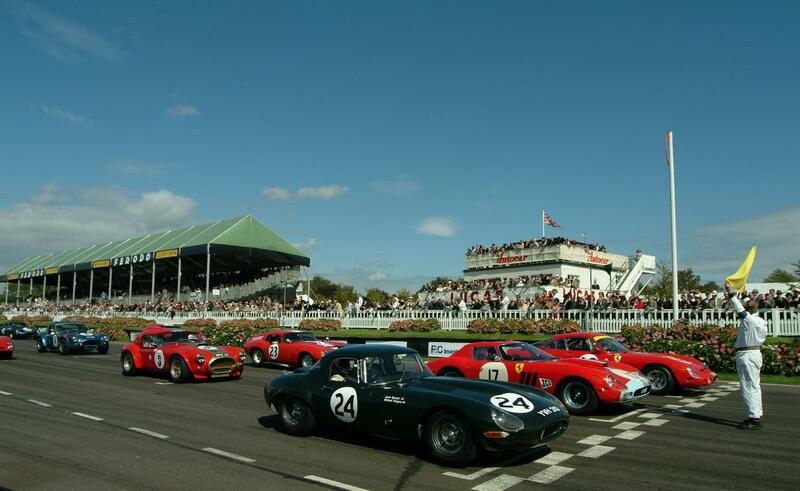 The Madgwick Cup is a name synonymous with Goodwood and the Revival, and this year’s race will feature a diverse grid of small-capacity sports-racing cars from the early 1960s. With a grid of svelte, lightweight Brabham, Elva and Lotus models, it should make for an incredibly fast and close-fought race. The Freddie March Memorial Trophy continues as a short sprint race for cars of a type that contested the legendary Goodwood Nine Hour race. It will feature a fabulous collection of classic sports-racing cars such as Jaguar C-type, Aston Martin DB3 and DB3S, Austin-Healey 1005, Ferrari 750, Allard and HWM. 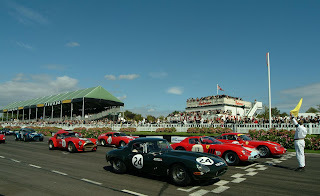 The Sussex Trophy caters for World Championship sports cars and production sports racing cars from 1955-1960. These big, powerful cars, from the likes of Aston Martin, Ferrari, Jaguar, Lister and Maserati, are perfectly suited to Goodwood’s fast, sweeping curves, and always produce a stunning spectacle. The Whitsun Trophy is the weekend’s fastest race and is always guaranteed to provide breathtaking entertainment and close racing. A wonderful selection of ‘big banger’ sports prototypes will once again unleash upwards of 10,000bhp between them. The legendary Ford GT40 will feature strongly, with several taking part, including a rare 1964 model. Providing stiff opposition will be legions of Ferrari prototypes, Lotus 30s, Lola-Chevrolet T70 Spyders and McLaren-Chevrolet M1s. This race features GP ‘titans’ and more nimble voiturette cars based on designs from before the Second World War. These sit-up-and-beg single seaters will thunder around the fast and spectacular track, just as they did in the circuit’s earliest years. In addition to a gaggle of ERAs, expect to see Alfa Romeo 308C take on Maserati 4CM, 6CM and 8CM, plus Alta, Bugatti Type 54 and Talbot Lago. A gaggle of super-rare Alfa Romeo Tipo B monopostos will also take part. The Richmond Trophy for Formula One cars (1950-1960) continues as a race solely for front-engined cars. This will offer exciting racing between the legendary cars from one of Grand Prix racing’s golden eras, with Maserati 250Fs out in force, battling against Ferrari 246 Dino, Aston Martin DBR4, BRM Type 25, Cooper-Bristol, Connaught, HWM and the unique four-wheel drive Ferguson P99. This race for 1960s Formula 1 cars will once again see a spectacular gathering of 1.5-litre GP cars, from the likes of Lotus, Brabham, BRM and Cooper. These cigar-like racers are synonymous with the important F1 meetings in Goodwood’s latter years, and the selection of cars taking part will focus on genuine F1 cars using fabulous-sounding V8 engines, making the race as noisy and exciting as ever. This year’s Formula Junior race focuses on the ‘late period’, when cars ran with rear-engines and disc brakes, which last appeared at the Revival in 2008. With so many Juniors competing internationally, the specification of the race changes every year, to give it a new look and character. This year’s race sees the cars in their ultimate form, and should once again provide fantastically close and competitive racing. The Earl of March Trophy regularly provides some of the closest, most competitive racing of the Revival weekend. 500cc Formula 3 racing was hugely important and popular during Goodwood’s formative years, and this year’s race should once again make for an intriguing spectacle. Our annual feature tribute will be to Juan Manuel Fangio, on the centenary of his birth and 60th anniversary of him winning the first of his five world championships. A daily track parade will include a variety of his most famous cars, to honour the life and achievements of this incredible man. From humble family saloons to racing icons, lusty sports cars to military vehicles, and rally legends to commercial workhorses, Ford of Great Britain has been responsible for some of the most iconic vehicles ever to grace Britain’s roads and race tracks. This year the company celebrates its centenary, and the Revival will celebrate with a parade of the greatest and most instantly recognisable vehicles from those 100 years. This year’s Revival will celebrate a branch of two-wheeled sport at which Britons were once dominant. Motocross was a hugely popular sport on British television in the 1960s, and this parade, featuring seven past champions from that period, will evoke memories of that era. This year marks the 75th anniversary of arguably the most famous fighter plane of all time. The Supermarine Spitfire first flew in 1936, and went on to become a true icon, credited with helping the RAF win the Battle of Britain. Having served as a Spitfire base during World War II, Goodwood is a particularly fitting venue to celebrate this anniversary, with an incredible gathering of aircraft, and a spectacular mass scramble where all the planes will take off in close formation.